In this article, I describe my new daily morning routine, emphasizing on the exercises and the change in philosophy that I did. I still like to think of myself as “young”, but I am not sure that is true any more. So, I would recommend this article and the exercises that I describe to my readers above 30. Or once you have a family and kids and your time is limited, but you still want to be fit, have energy and look good. Time to read: 9 min (based on 150 words per minute). What was wrong with my morning routine? I had developed my previous morning routine over a period of a few years. I used to do a lot of bodybuilding when I was younger (7-10 years ago) and I did not need a morning routine because I was going to the gym at least four times a week. And on top of that, I was also actively playing different kinds of sports – tennis, soccer, skiing, and so on. But when I settled and I reduced the time I spent being active, I had to find a way to keep being fit (and not fat). So, my answer was the morning routine and at first, I only wanted to concentrate on adopting the habit of doing something in the morning. I started very light – only with push-ups. At first, one series, later two, and finally three. At first only 10 repetitions, then 12, and I finally reached 20. This process alone took almost a year. After I was starting to get bored with the push-ups, I added squats. Again, increasing the repetitions and series. And finally, I added planks and leg raises. In the beginning, I used to do all my exercises in one go, after I woke up. Then, I started waking up before my soon-to-be wife Gil (you can read her articles here), and also doing the morning chores (prepare coffee, breakfast, squeeze orange juice) while doing the exercises. This was an awesome idea because in any case you need to cool down and rest between the series. Meanwhile, I started a family, had a child, and with my personal time getting less and less, I started adding more and more chores in the morning (e.g. lunch for myself and my wife, milk for the baby). And finally, after doing this for about four years, I decided to change something. The problem that I spotted was that I was concentrating only certain muscle groups and totally neglecting the rest. Especially, since these exercises and walking to and from the office (after a few years I managed to keep averaging about 10,000 steps a day – here are a few tips on how to do that). So, a few months ago, I started doing research on the different muscle groups (combined with learning how to do proper massage, this will be an upcoming article), and I decided to break down my work-out routine and concentrate only on a few muscle groups a day. 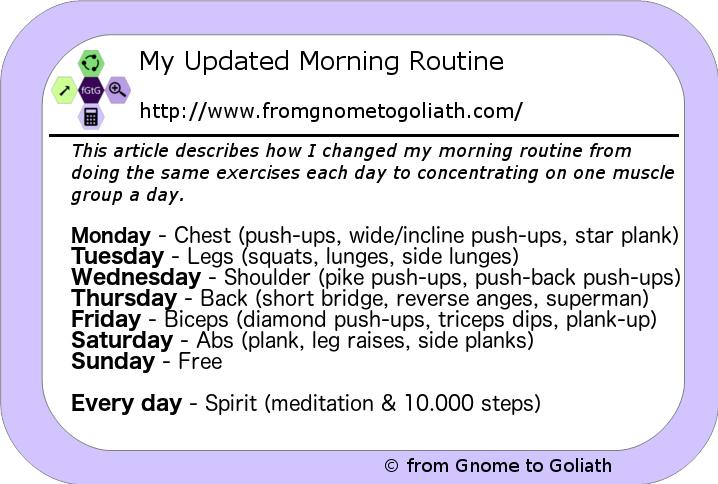 For my new morning routine, I kept a lot of the other elements, and I only changed the workouts. I still start with 25 minutes of meditation, before anybody wakes up. This usually means 5:00 AM. If you are interested in a few tips about meditation – here. I am also trying to squeeze 5-7 mins of keeping a journal, but this is work in progress. After the meditation, I go on with my exercises which I split into 8 series of various repetitions (depending on the day). Why 8? I don’t know, it works for now. This is my “chest” day and I’ve saved it for Monday, because it is very important to me. Also, I have more energy on Mondays because I am resting on Sundays. I also train shoulders and triceps as side-muscle groups. Tuesday is my legs day (quads, hamstrings, calves). As I mentioned already, I only used to do squats. And when I was going to the gym I never used to do any legs exercises because all the sports that I was doing were heavy on my legs (soccer, tennis, skiing). But now, when I started exploring what I can do for legs, I noticed that I have been under-performing on my legs by sticking only to squats. I tried a few versions and since at least 3 of the groups also train biceps and triceps, I decided to have Tuesdays for the legs and Thursday for the back. This is how I picked shoulders, neck and traps for Wednesdays. Eventually, I would like to replace the pike push-ups with elevated push-ups. By Thursday I usually need something completely different since I have already exercised my arms twice (Mon and Wed are similar especially for the side-muscles). This is why I picked back exercises. Once again, I found that I have been neglecting my back a lot in the past. And this is wrong because the second more important muscle group for a man to look good (after chest) is the back. Or hands, depends on who’s looking. On Friday I also fast (personal thing, not necessarily religious) and Fridays are still hard for me. My concentration is on biceps and triceps. And it works nice with Mon and Wed so that I have 1 day of arms-related exercise and a completely different one on the next day. Saturday and Sunday are my family days. I still meditate in the morning and I decided to leave the abs and glutes training for Saturday mostly because it is fast. In the winter, I struggle to get my 10,000 steps a day, so I try to “walk in place” while I am watching TV with my kid. This is my “free day”. I just meditate in the morning and I still try to do my 10,000 steps by walking in place if needed. Overview of my updated morning routine. After I had already formed the habit of doing exercises in the morning, I decided to do a better job and devote a day to each main muscle groups. This resulted in the morning routine described above. Only in two months, this has visibly changed my body, my energy levels, and self-esteem. My next goal in the near to mid term is to concentrate on increasing the reps and keeping the 8 series. I am sure that after a few years, I will have to change it again. But until then, this is how my morning routine looks like. Previous Previous post: Help! My Manager is an Introvert!